Kenroku-en’s Beauty: The 6 aspects of a perfect garden. Kenroku-en is a Japanese garden located in the center of Kanazawa city, in Ishikawa prefecture. It along with Koraku-en in Okayama prefecture and Kairaku-en in Ibaraki prefecture, make up the 3 famous gardens in Japan. 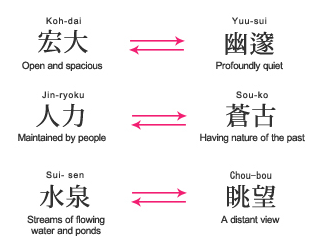 The name, Kenroku, refers to combining the six aspects of a perfect garden. Chinese poet Li Gefei once wrote about the six aspects of a garden saying that because they conflict with each other, they couldn’t be combined into one garden. These are the three sets of conflicting aspects. Kenroku-en transcends the limitations and includes all six of them. Worthy of the “Kenroku (six aspect)” name, it’s a transcendental garden landscape. 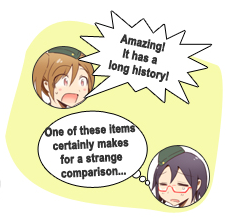 Kenroku-en’s History – 500 times older than Granzella! Kenroku-en Garden’s creation began in 1676 by the Kaga clan. As of November 2011, when compared to Granzella, which was established in April of 2011, Kenroku-en has over 500 times more history to it. (But we’re trying to catch up as quick as we can!) Originally it was named Renchitei but in 1851 it became known as Kenroku-en. Surprisingly, the garden has remained almost unchanged from that time. Just like the most popular PlayStation®Home lounge, Great Edo of Nippon, people come to Kenroku-en Garden to experience atmosphere of the iconic Edo period. Kenroku-en is a vast location. You can expect it to take at least 1-2 hours to explore the whole area. There is no planned route to guide people around the area, so those visiting for the first time may get lost. 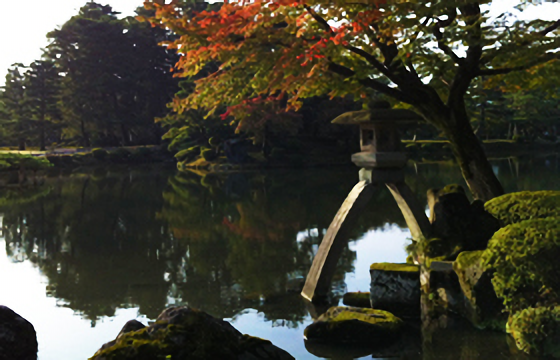 Because of this, we recommend first to walk around Kasumi-ga-ike, the largest pond in the garden. Here you will get a general idea of the things you can expect to see in the garden and it will help you to keep your bearings. The Kotoji Tourou (stone lantern) is known as the symbol of Kenroku-en. Originally designed with two legs, a leg was broken somehow but it was put on top of a stone and has kept it’s excellent ballance since then. The broken leg still lies on the ground beside it. Drawings from the past show this to have two legs… What in the world happened? 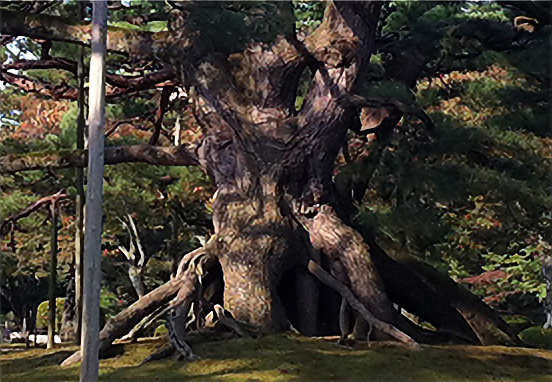 The roots of more than 40 black pine trees, both large and small, were raised to a height of 2 meters above the ground. A long time ago, as a young pine, it was planted here in the soil. After growing some in the soil the roots later became exposed, it is said. 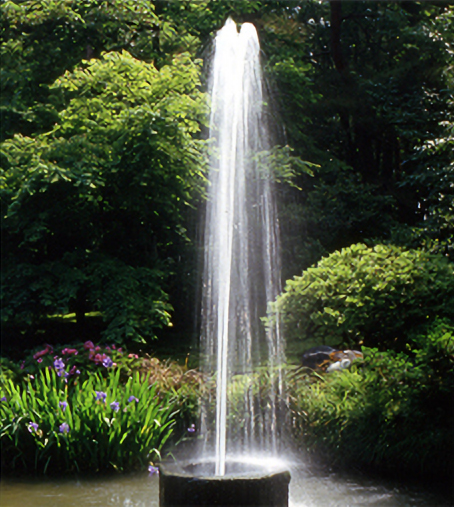 This fountain’s water source is the Kasumi-ga-ike Pond and it is able to push the water up to 3.5 meters high. The top of the fountain, where the water comes out, and the water’s surface level of Kasumi-ga-ike Pond are the same. It’s said to be Japan’s oldest fountain. Even if you saw every fountain in Japan, this fountain has a deeper history. This graph makes it easy to understand the differences. 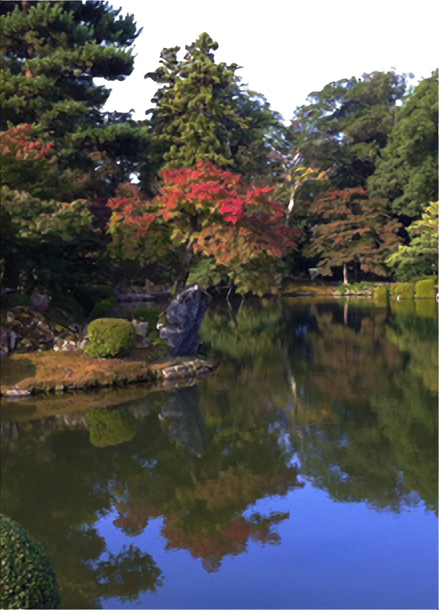 Admission to Kenroku-en Garden is 300 yen for adults and 100 yen for children. But even if this isn’t inexpensive enough for you to view the garden’s beauty, surprisingly there’s a way to obtain free admission! (legally) At Kenroku-en Garden, every Saturday and Sunday is “Resident Appreciation Day.” You’ll be exempt from entrance fees as long as you live in Ishikawa Prefecture. If you go twice a week, you’ll save 30,000 yen in a year, or 1,500,000 in 50 years. 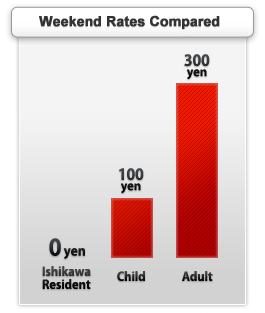 Surely this is reason enough to move to Ishikawa Prefecture!